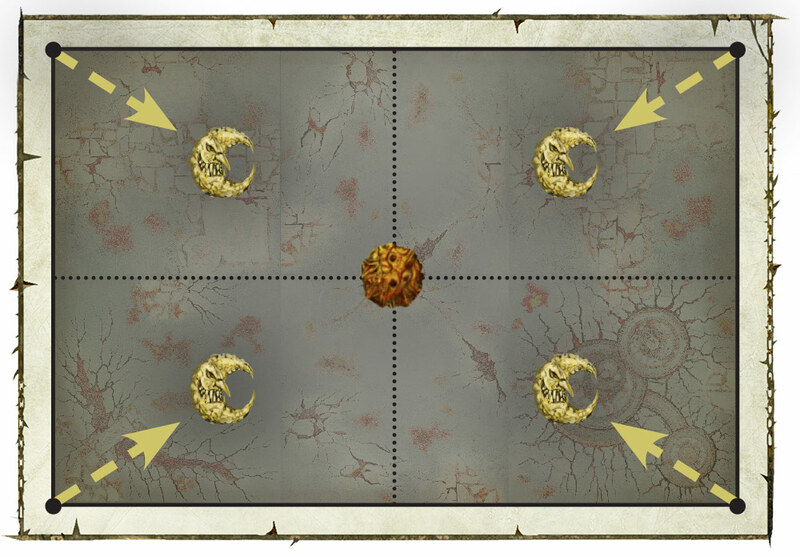 - 2 x 22x30” double-sided, folding card gameboards that are used for the missions in this game. So that make 4 maps. -2 sprues of scenery containing each: 5 doors, 4 barrels, 10 crates, 1 pipe, and 1 cylindrical container. Nothing bad to say on the stuff inside, it's GW quality, everything is top notch. The design intent is competitive gaming ! 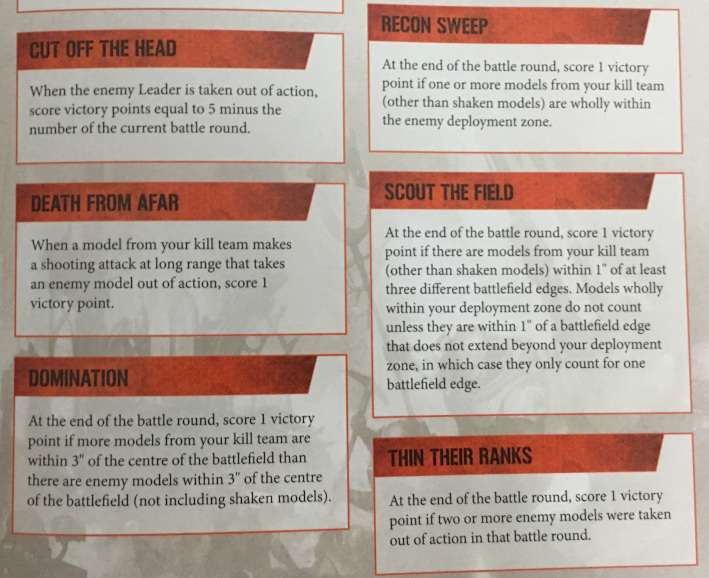 The set of rules force moving up the field, holding points, assaulting position and so on...It's obvious that kill team focused on only long range shooting or with a very low count of models (while stronger) are going to suffer in this game mode. One other interesting part is the symmetry of all the missions. All maps are 100% symmetric and have the same covers in the same positions. So it's 100% fair games. The Objectives are multiple in each game and include all component of the game like: ranged and melee take out, holding point, moving fast ...it's really interesting to see the attention they accorded to these and made sure to force interaction between the two players. Lastly, each mission has an optional special objective that can be chosen. 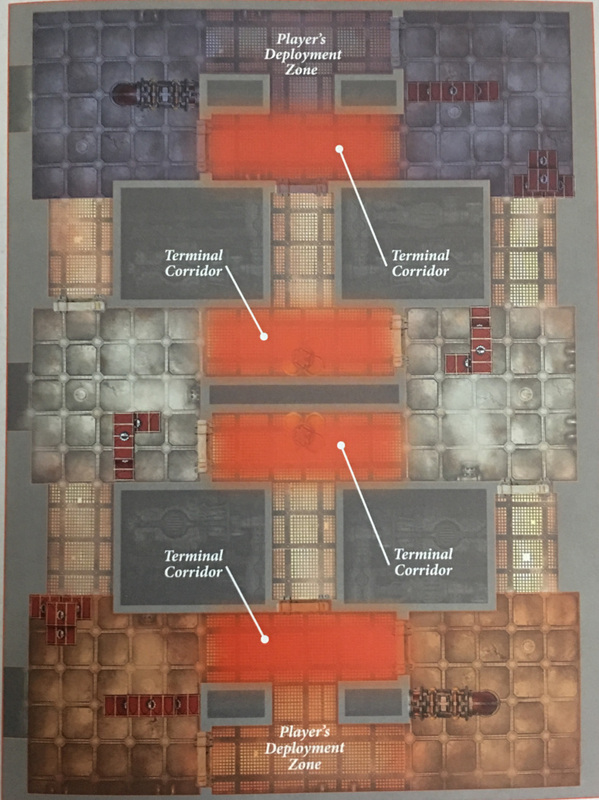 To sum it up, Arena games are: short, filled with objectives, force you to interact with the other team and require you to have a diverse kill team. At least that is the intent we will see what the meta look like in a few months. The good news is no tactics inflation for this game mode (in 1vs1) yea they added nearly nothing (it's not like we needed more ^^). Still, there are a few added rules and some specifics in the missions and boards. The new stuffs : are walls, doors, tactic. In the Arena box, you get 2 decks of 12 objectives and you choose 3 before the start of the game (secretly). Each one grant 1 VP but one of them "Cut of the head" grant 5 VP minus the turn you are in..
Each mission is about holding or capturing zone (or spot), no mission last more than 4 rounds and you can't gain more than 9 points of missions VP. While I regret that there is no rules on how using the other terrain set or boards in a competitive setting it's a good box. 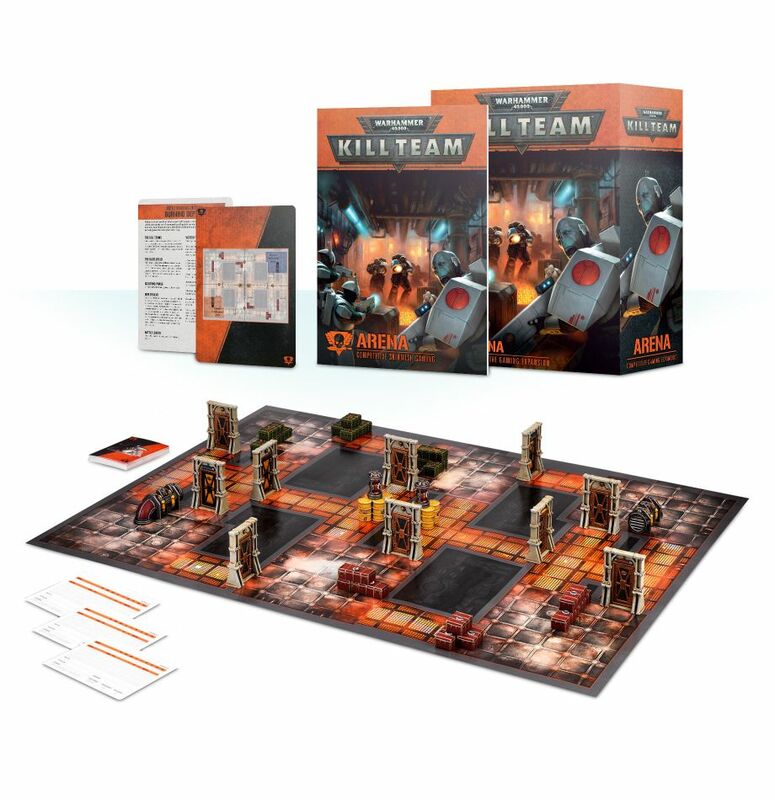 Very welcome addition to kill team, the intent really reminds me of Shadespire and i am eager to play it more !! Gloomspite gitz Battletome review ! This book has a lot of stuff and we'll be reviewing it this order: Moonclan, Spiders, and Trolls! This Battletome is 112 pages with hardcover as all Battletome it includes, Fluff, Artworks, Painting and covers a large number of units. As usual, you'll be able to select: Traits, relics, Battalion, and differents Battleline units depending on the General. So let's get to it there is a lot to say! 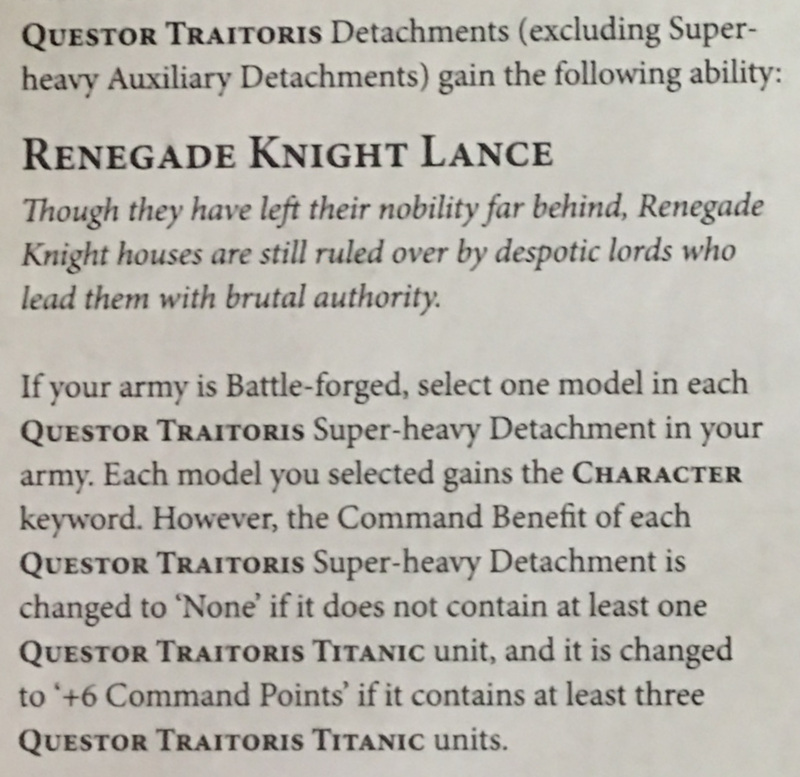 The Allegiance Ability is tied to Gloompspite Keyword and has been already spoiled by GW But I'd like to give extra details. The moon starts in one corner (your choice) and moves to the opposite corner. Once it reaches it, the Moon is out for the game. If 2 players are Gitz only one moon is placed (Roll off to choose). The moon grant bonus if you are wholly within the right table quarter or to the whole table. You get no bonus if you are in the corner. At the start of each round after the first one, roll a dice: 1 no move, 2-5 = 1 move, 6 = 2 moves. Gloomspite Gitz Wizards under the Bad Moon get +1 to their casting rolls, while all other wizards get -1. 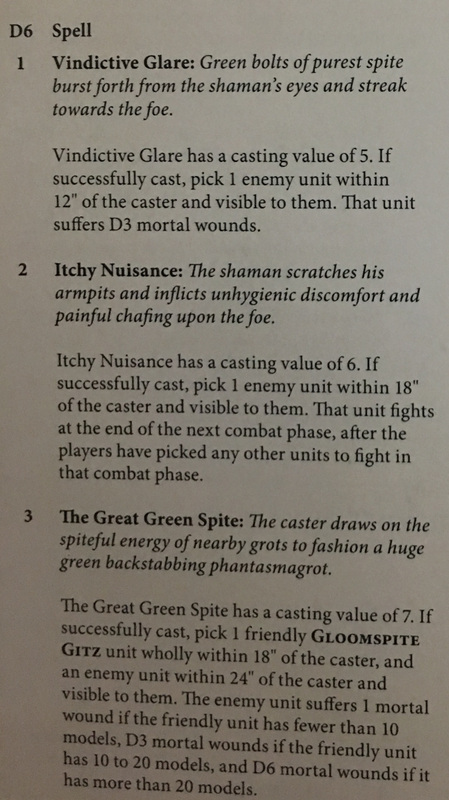 Gloomspite Gitz Generals get an additional command point in each hero phase they’re under the Bad Moon. Squigs under the Bad Moon can run and charge in the same turn. 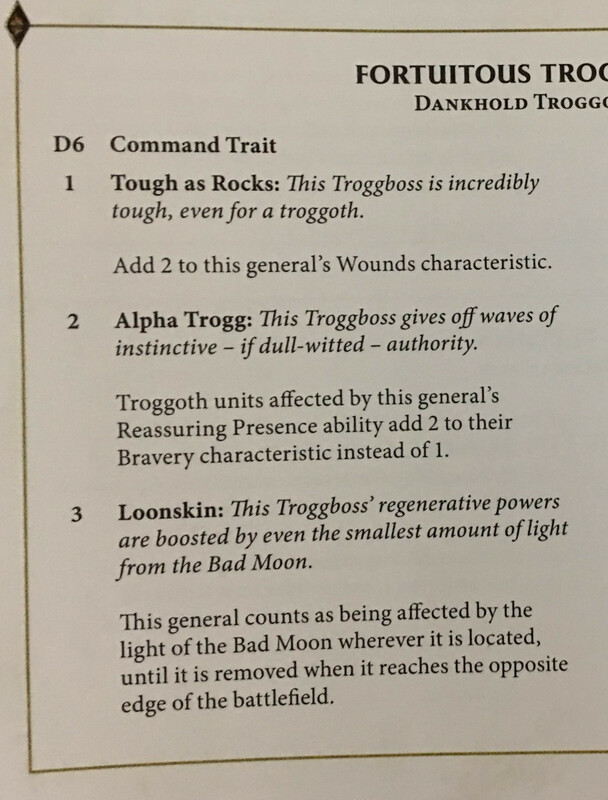 Moonclan Grot units re-roll hit rolls of 1. Spiderfang Grot units deal mortal wounds on a 5+ to hit, rather than a 6+. PS: It looks strong on the paper but doesn't count too much on it unless you have the Loon King. My Personal favorite !! The LoonBoss on Mangler Squigs is a great model, Crazy amount of damage on a charge, Buff other squig in a huge aura. Must have! Another interesting choice is the "GobbaPalooza" it's 5 gobs heroes choose as one unit but all actings independently during the game and all have different little powers. (some very good debuff). Leader slots are super tight in a Moonclan army (or spider) and having 5 heroes without using a leader slot is value ! Rule of thumb for this battletome, everything but battleline feel overpriced. Stabba & Shoota didn't change. MoonClans have a lot of Wizards and they are going to need them! ^^ Multiple spells deals Mortal wounds, some of them are very strong. You are going to need a bunch of those spellcasters if you want to have a chance. Also, there are a few good debuff spells that force a target to fight last (super good !). Very strong stuff! 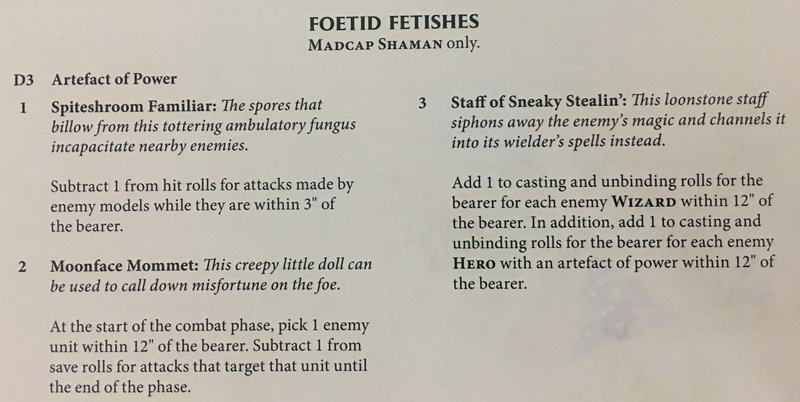 Foetids Shaman relic list is "SOLID"
Other relics list are Ok-ish but it doesn't matter as you are going to take Moonface Mommet or Sneaky stealing. Both synergize very well! -Spider Tide: Not great but Huge range. -Spider Cauldron: Great buff, +1 cast and unbind, grant full spell list to the caster (Nearly auto include). It's Free, Respawn shootta & Stabba, and auto pass Morale in a WW 12". Strong but placement rules force a defensive game! Moonclan characters commands power are limited in use. Squig heroes buff Squigs, non-Squigs buff Moonclan Grotz (a keyword reserved to basic Stabba & shootta). Stacking caster is the intended playstyle i think and could be super fun to play. If you can get all those casts/unbind bonus you are gold !! Let's get to the spiders !! If you love spider you'll be satisfied with this part of the book. The shrine, it's free and auto pass morale around it (12" WW) but the placement rules prevent aggressive play. *Shaman Version *: This one has a spell that double the amount of MW inflicted by a unit. Cast it on a big spider rider unit and profit. That mean getting 2mortal wounds on a 5+ with 2 attacks per spider. The spell last until next hero phase. This is soooo strong !!! Also if you roll 10+ you can buff more than one unit. *Solo Beast *: Deep striking giant spider fun time for the back line ^^ there is a Battalion improving the charge chance. but they only cost -40 compared to the shaman version so i think i prefer having another slingger. -ScuttleBoss : 100, Command that reroll charge range (and riders attack). He's the only one that can get Trait. Not super useful. -Spider Rider : Battleline if General is SpiderFang. Fly, shoot, deal mortal wounds, get a discount at full force, awesome. You can make them faster in a rider formation (+2 move). Love them! Quite the limited selection but sound like the scary army of the book! 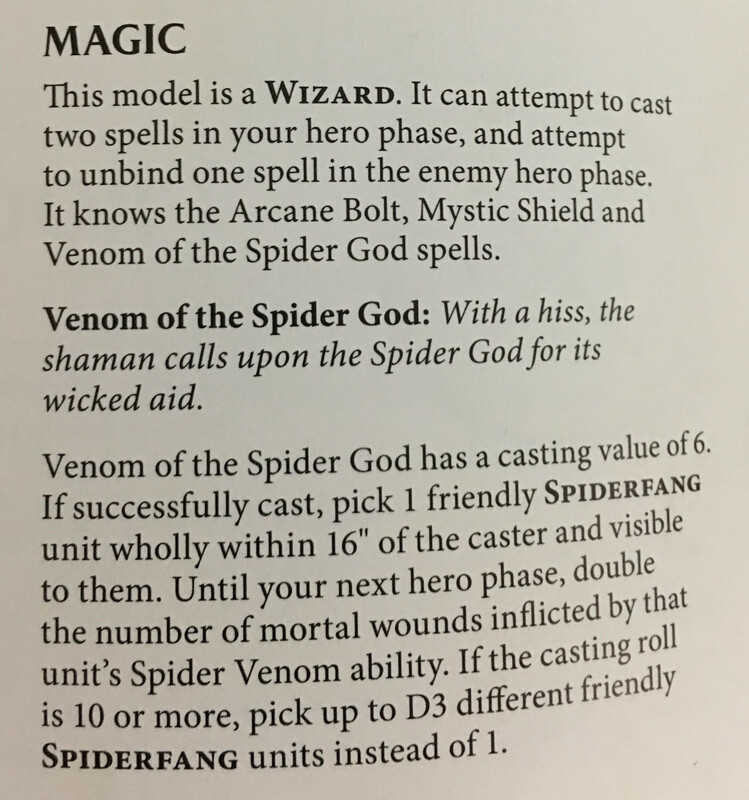 Not sure what is the best build, maybe I'll go Loonking + 3 Squig for battleline, Spider shaman on Giant spider, then double max riders and 2 more shamans I think. Now that the spiders are done Check some trolls !!! Trolls have a Hero that grant other trolls as battleline. So yea you can go Full trolls! Regulard Dank is 10w (4+) and 3 Attacks, boss is 12w / 4 attacks (220/300). You need one boss for having River and Strone Trolls are Battleline. Both versions have one hit kill power that is interesting. Nothing else to say about them, Awesome models, Ok stats, big trolls. Bravery is a problem as losing extra trolls is going to hurt! Still having multiple small units of stone trolls is a decent ranged threat! One relics grant a 4+ FNP that stop working on a 1. For trait i think i prefer the +2 wounds or +1 bravery aura. A few weeks back RGG offered to try their new mini holder and after using it for a month, I'd like to do a quick review on the Handle! The RGG360° is an ergonomic handle with a rotating 360° top. The models are fixed on it with some sort of orange putty. The model I tested is a 3D printed prototype (it's amazing what you can do with a 3D printer these days). I want to review these aspects of the product: ergonomics, rotating top, the putty, stability. Let's dive into it then! The ergonomics of the handle is really nice and help stabilize hands while painting. It feels like a small skying baton handle. You just have to place your thumb in the slot and voila! The hold is good and stable. To be fair, It's like the GW handle, you can tuck your thumb under the plateau but the difference is that the larger bottom prevents to reach the same level of comfort/stability. After using it for a month I really prefer this shape of handle and don't feel the same comfort on the GW one. In Conclusion, I really like the RGG360° comfort and stability for longs painting sessions. As seen on the introductory video you can rotate the top of the handle. it works very well, there is enough resistance to prevent unwanted movement* but not too much that you have to use strength to rotate it. At first, I didn't consider the 360° rotation as an important feature. Taking advantage of it was not easy but after some time it's really handy and would miss it badly! Conclusion: Unexpected super helpful feature. The top of the handle is covered with orange putty that feels a lot like blue tac or "patafix". It holds models very well, even metal Warjack from Warmachine didn't move. Using this method of fixation allow the handle top to be thin (around 25 millimeters). The good point is that doesn't prevent painting from under. It's my main gripe with the GW holder. The sheer size of the Claw Mechanism prevents painting from bottom angles. A few things that I didn't like with the putty: If you use a base with a central slot, putty get stuck in there. You have to press strongly to fix the model and it's bad when the base is already painted. 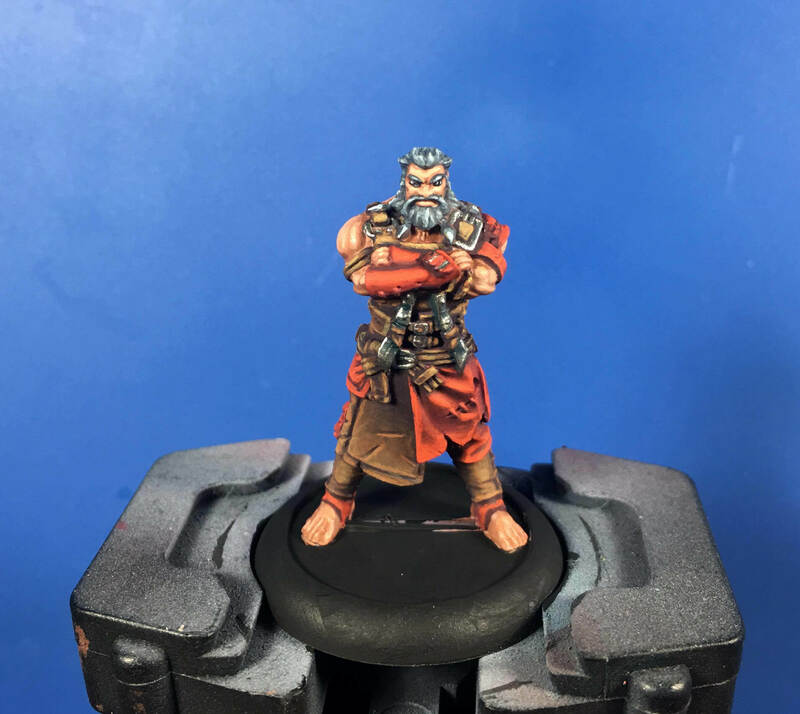 Lastly, with bases a lot larger than the top (40mill and more) having your thumb on the side of the base while painting unfix the model (with a simple lever effect.). Note: RGG told me that the holder will be shipped with extra putty to refill/change. Even if at first the putty doesn't look like a great idea, it does the job very well and models don't move at all. With a handle this thin, is stability an issue? on the 3D printed prototype, it was :(. The handle fell 2 times when I put it back on the desk. Of course, it was user error and the model is big and in metal (a bit bigger than a Stormcast) but I would I have liked a base to slot the hand. After talking with the RGG team, they told me the finished product has a better weight distribution and only the 3D printed version has this problem. The explanation is: To make the 3D printed prototype they used a lot of milliput at the top and it fucked up the weight distribution. They also assured me that the end product will be super stable. Still, a small base to slot the handle when you put it back would have been awesome. I installed a small base on my desk (with an old tequila glass) to prevent more fall. Note: It's impossible to take the handle apart without breaking it. While the balance problem kind of bother me, the handle is excellent. This is now my default paint handle. I don't reach for the GW or other brands as much as possible. Totally recommend this handle for any painter !! Review : RedGrass Brushes set ! Let's talk about "Brushes" !! i wanted to write this one for a while but i didn't had the chance. I don't know if you remember but a few months back i reviewed the Artis Opus brush Kickstarter. My conclusion back then was : "Very good brush but very small for the size and a few tips problem". While saying this the Artis were my new favorite brushes for blending and highlighting, they allowed me to "Lvl up" my painting. A few weeks back, the good peoples from RGG sent me their new brushes set for review. I was off course Super hyped to do it as i love the Wet Palette they made last year. The set is composed of only 2 brushes . One size 2 and one 00. It's advertised you can do everything you need with these 2 brushes, like a pro ^^. I totally agree with this philosophy and unless you need a super large brush to dry-brush a castle wall or something, you don't need anything more. Let's look at the quality and then at the promise of painting everything with 2 brushes only ! The size 2 is the workhorse of the set, very big, with a huge reservoir and a very pointy tip. 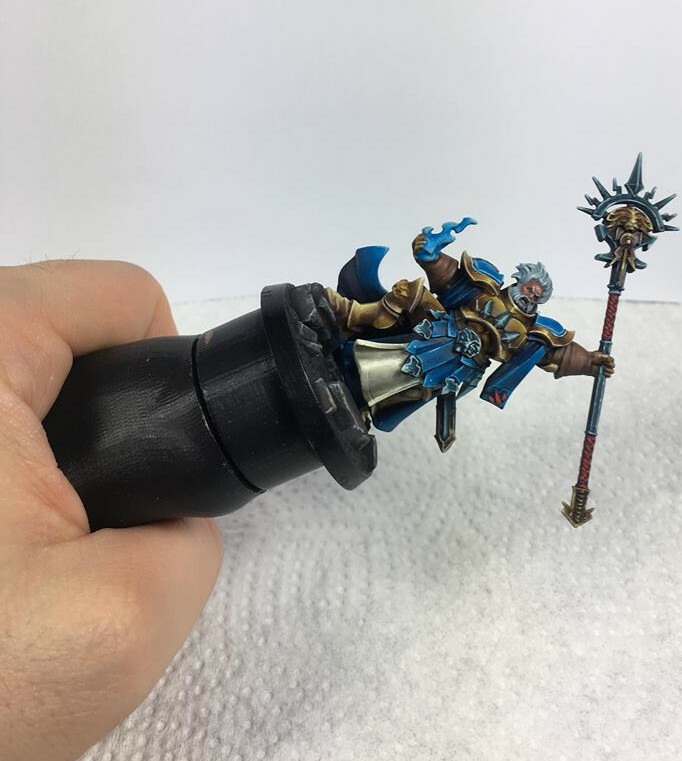 he's maybe a bit stiff and you need to compensate for this when 2 brush blending or feathering, that mean you have to incline the brush a bit more. Also at first i had some trouble of paint release but i think it was du to the preserver the brush maker used, after washing the brush with warm water there was no problem anymore. Lastly if you have to much paint in the reservoir it start to deform the tip so even if it's tempting to load the brush big reservoir, show some restraint !. Other than that, this brush is my new stapple, i do everything but the finer details with it and honestly the tip is so crisp that i do eyes with it. The Size 00 : I usually don't bother with brush under size 0 unless i paint eyes so i wasn't that hyped by a 00. After using it for a while my point of view changed, allow me to explain why. First, the brush tip is perfect and you can trace the most precise line with it, secondly the reservoir is big enough to have paint not drying in 10 seconds. It was quite a good experience to paint with this one. More and more now, when i am on a tricky part of a model i reach to this size 00 as it make my life a lot easier !! I couldn't go back now ! 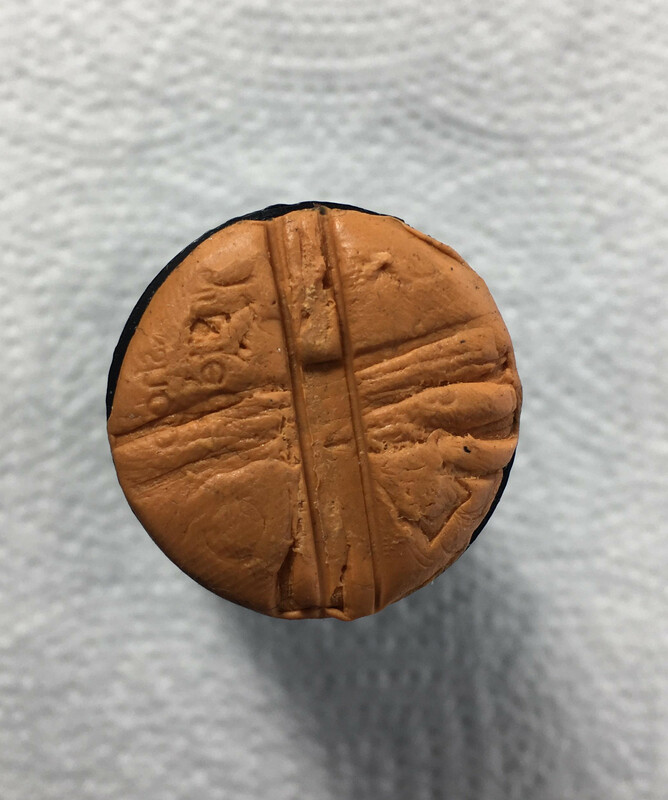 When testing brushes i tend to treat them roughly to see how they endure a few weeks of bad treatments. I still use Master Cleaner and Preserver but often i don't wash when i stop, or i stuck paint into the ferrule. In this case after 4 weeks of use, the RGG Brushes are still in a ok shape. The size 00 is more fragile and you need to take care of it to keep a perfect tip and hairs. Size 2 seem ok nothing special to say about his toughness this is not an old Raphael but still got a very good durability. So now that i have used a large number of brush brand i want to share a Top 5 of them. Off course it's only my point of view. And even the 5 is still a super good brush. Size 2 Artis opus : Very good brush, the tip is a bit weird but does the work. Only needed if you want something smaller than the size 2 from RGG. Artis opus brush are smaller than Raphael or RGG so this size 2 is a size 1.
note : The Raphael on the left is 12 years old i think ^^, the old series from R and W&N were the best. Read the note at the end. Artis Opus series everything from 1 to - 000, didn't tried their new size 3 & 4 so i can't comment. Raphael 8404 : used to be my favorite brush, they are still super good but the competition make better products now. W&N Series 7, the venerable WN. Good brushes but a bit too soft to my liking. Size comparable to Artis Opus. ps : Old series of W&N and Raphael (8+ years) should be Ranked First without much trouble, but those times are behind us. Now the quality control and hairs used is not as good. I heard multiple explication but i can't confirm or deny these version, i just know that the quality offered by these 2 brands is not as good as before. Big yes on the RGG brush, If you are in Europe and can get free shipping there is no need to hesitate for the price. These are 1 step ahead of the competitions and if you treat them ok you should be super happy for a long time. 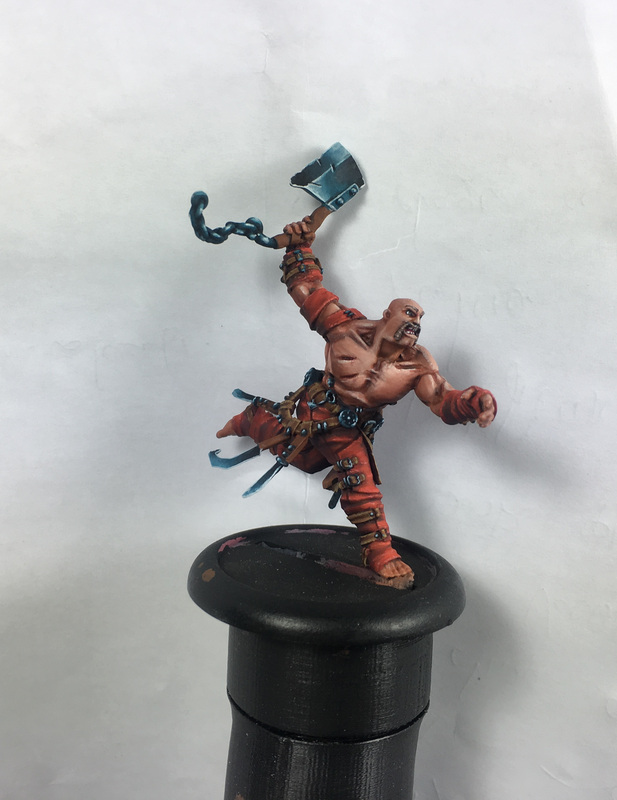 The size 00 from RGG is now part of my process and i don't imagine how painting without it. Still don't forget that the size 2 is huge and could require some adaptation or a size 1 brush (in this case i would advise the Artis Opus size 2 as a supplement.). No knight Preceptor :/ but Armiger and Dominus are added ! -Normal knight but chaos aligned . -Can equip dual ranged weapon get access to carapace weapon also. Take the 2 dominus version into a single one, but sadly you can't mix the weapons. 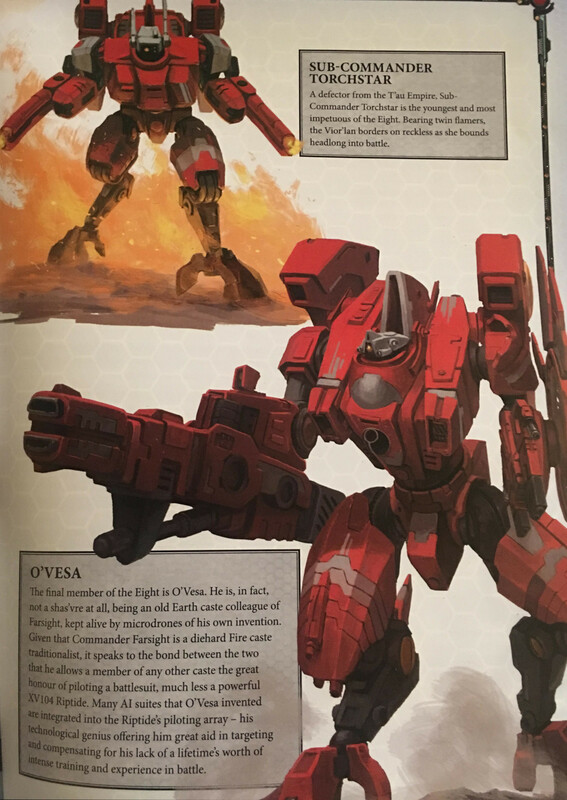 So it's the Harpon and Conflagration canon or Plasma and Volcano lance. Very cool addition to the Chaos lineup ! You'll get acces to both version of the Armiger. Sadly like with the dominus you can't mix the weapons so it's : thermal spear + reaper chain sword or Dual auto canon. Points Unless i am mistaken are aligned with the Imperial one. 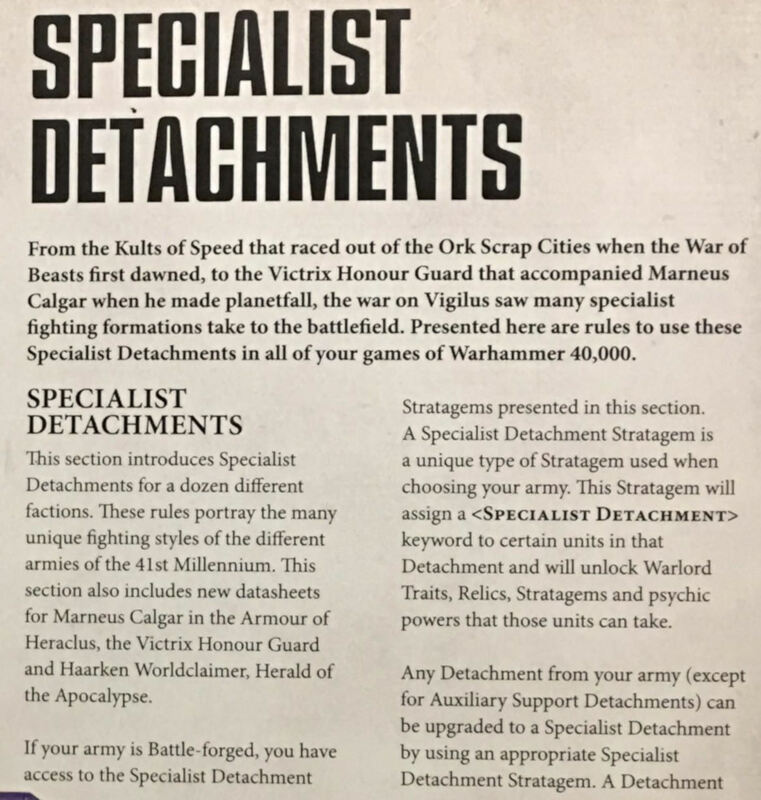 All fit on 1 page, there is one detachment, one trait, one relic, 2 stratagems. That's it for the Traitorus knight ! Dinner time here and i'll try to do Matched play mission and Vigilus fluff after ! Second review of the day with "The Eight" it's a 8 man commander detachment included in the CA 2018. 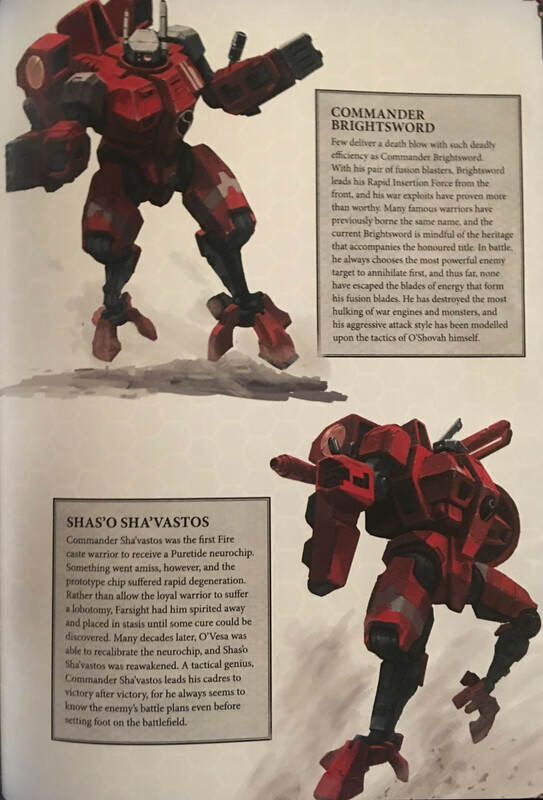 The Eight are the greatest champions of the Farsights Enclaves, led by non other than Commander Farsight himself. 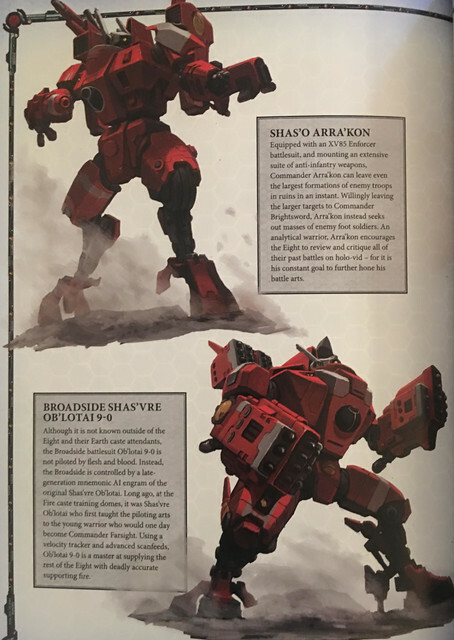 The Eight take to the battlefield as one, a band of fearless warriors piloting some of the most powerful Battle suits the T'au have ever created. To me it's the most interesting part of the formation, each one of there is a hero with some cool background. Being able to play a Gundam cast is such a cool idea ! even if i never really like the T'au i want to try this one ! -Must use a Super Heavy Auxiliary with -3Cp and no extra signature system. -You get 8 models and 14 drones for a bit more than 1100 pts ! -Sept Tenet : Reroll wound roll of 1 for ranged attack within 6" of the target. -Crisis sized suits can Manta strike. 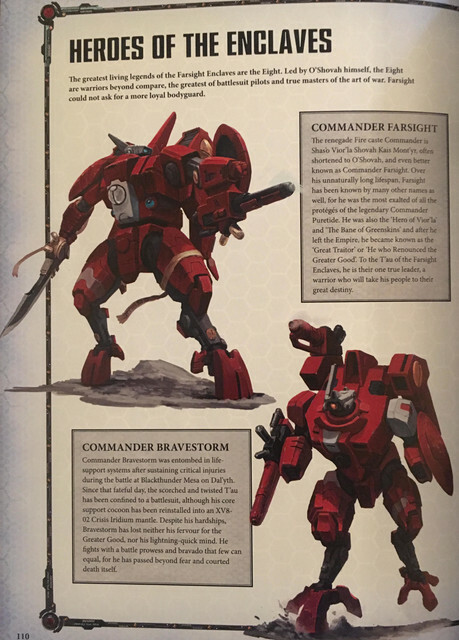 1) Farsight : Unchanged from T'Au dex. 5) Arra'Kon : Inflict mortal wound when charged. 6) Torchstar : No Deepstrike bubble (12") and -1 to hit her with ranged attack. 7) Ob Lotai : Reduce dmg taken by one and ignore malus to move and shoot with Heavy weapon. 8) O'Vesa : Normal riptide with ws 6+ (earth cast noob^^) + reroll 1 to shoot and 4+ to avoid MW on nova reactor. Look like a fun detachement but i am not sure it's going to be effective on the table. I am not sure there is enough shooting for the price but i hope i am wrong ! My only rant could be the display of the rules everything is cramed on 3 pages it's hard to ingest ! Next stop Renegade Knight ! 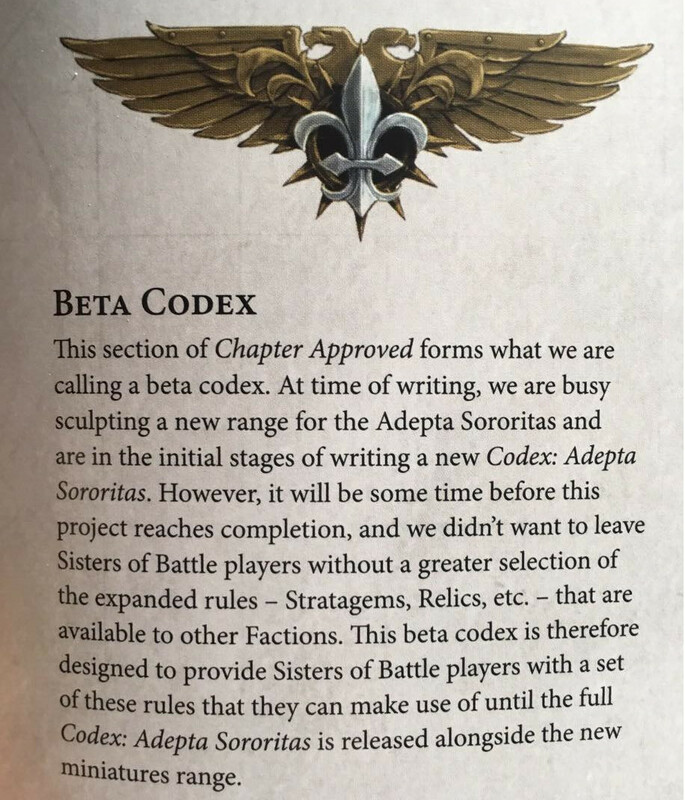 This beta codex is included in the Chapter Approved 2018 Edition. 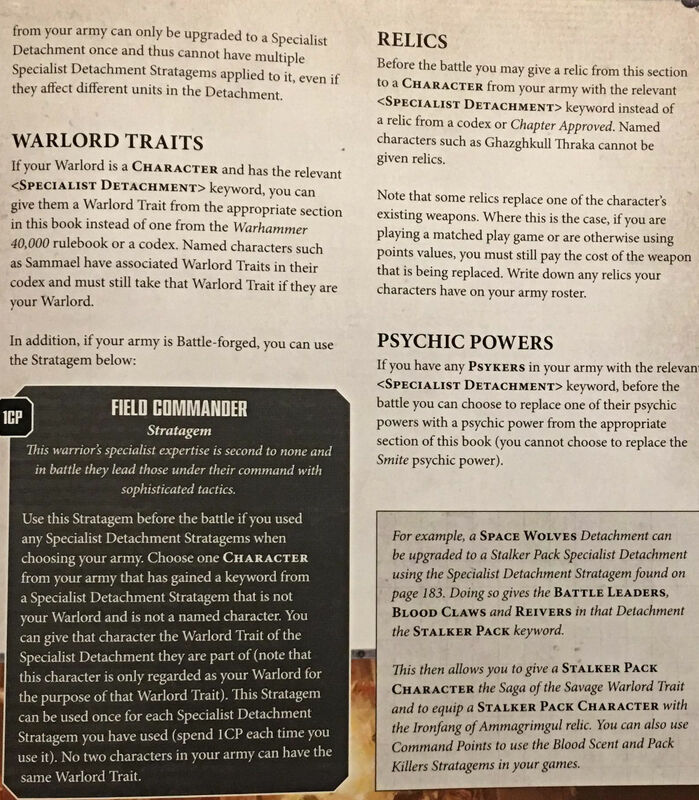 32 pages with fluff, artwork,stratagem, trait, relics and chapter tactics. They kept the Faith point system even if the point generation is different. -I have been told that new range is exciting and not limited to concept already existing. 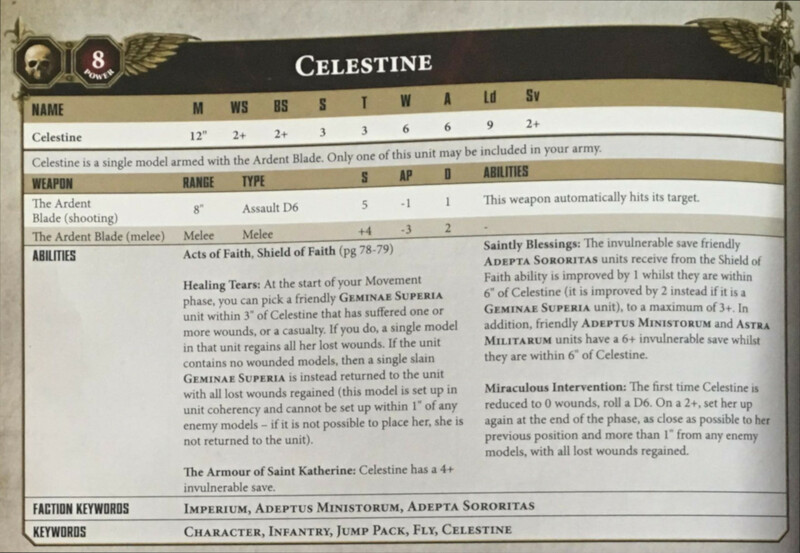 All sisters but Celestine and her 2 bodyguards have keywords for the chapter trait. 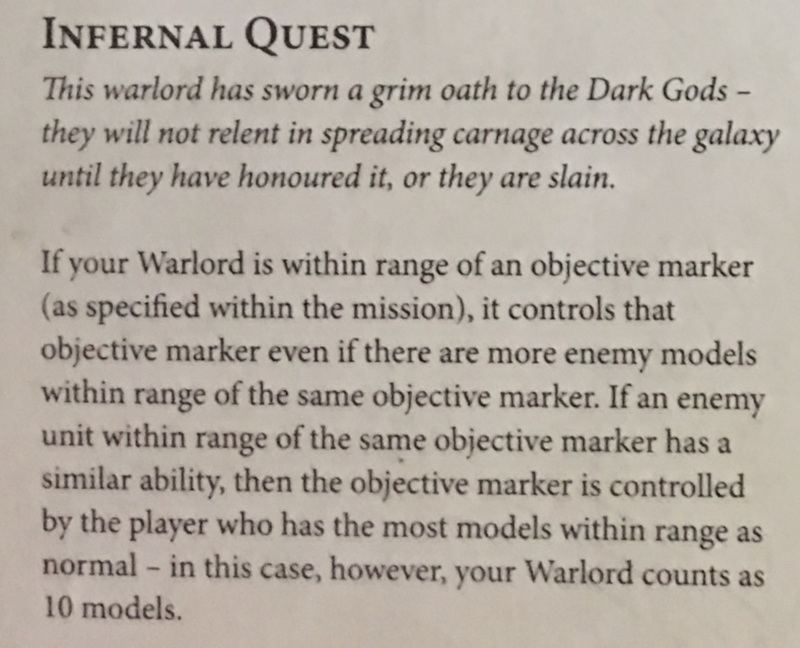 Models with this rule get a 6+ Invul save against melee and range attack and can deny the witch but with only 1d6 (trash unless you have Brazier of eternal flame). 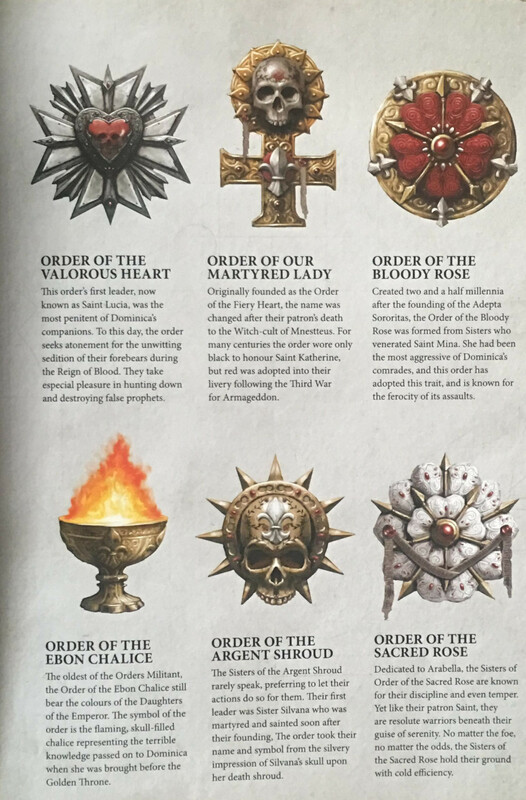 -Canoness warlord trait : grant a 5-6 base invul save for units within 6"
All priests, Flagellant and penintant don't have this rule. Maybe the Aura limit is a bit short but i can have a wall of 4++ rhino ^^, a bunch of 3++ Seraphim or even a pack of exorcist with a 4++. 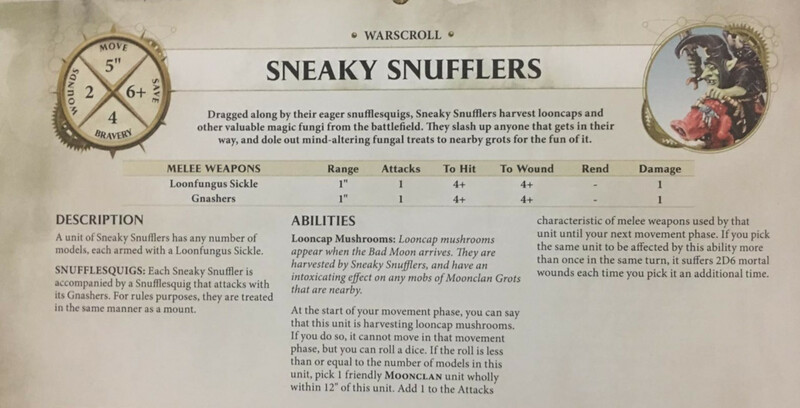 I don't know if it's super strong or not on T3 models but i am sure there are some hope here. -rolling a dice and scoring more or less than the difficulty. Faith points generation have been changed. You start with 3 points + 1 for every 10 models with the rules "Act of Faith". 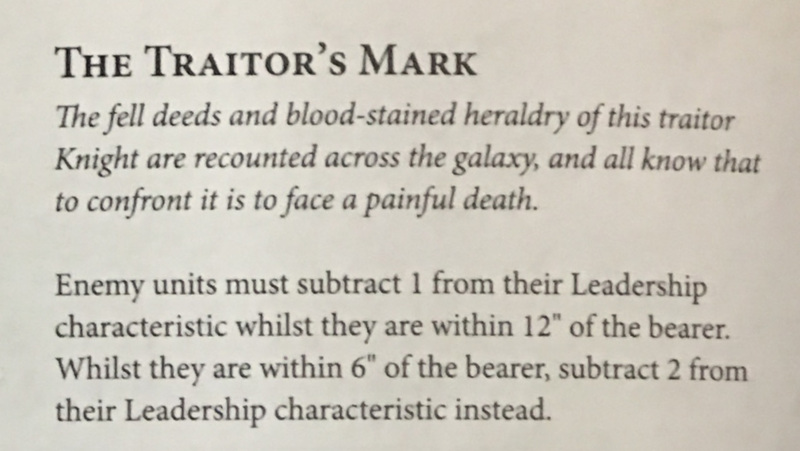 -1 stratagem grant 1d3 FP when you loose a character (3 if it's your warlord) you can use this one in reaction of the death of your character. -1 order conviction grant 1 FP when you loose 1 unit. -1 order convition grant 1Fp on 4+ if you destroy one ennemy unit. -1 relic grant a 5+ refund one FP used to cast an Act of faith. Ps : Models don't have to be in the same unit to count, characters also count. Casting an act of Faith is simple, select one unit with the rule "Act of faith" , pay 1 point of Faith roll a dice. If you roll more or equal than the required difficulty it's a success. Note that All AOF are once per battle round success or not. -Dialogus 6" Aura : Reroll AOF. -Chapter trait granting +1 to AOF rolls. Hardest to cast is 5 easiest is 3. At best you get a +2 and reroll. I really think the chapter trait is nearly auto include. Nothing over the top appart from the Double pile in. But off course +1 to shoot combined with the stratagem to affect Other sister in 6" could be super nasty. 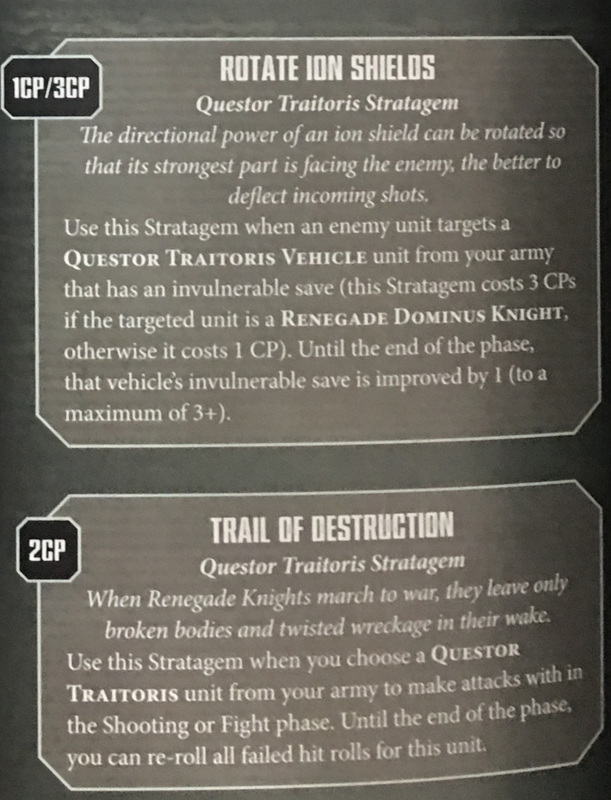 Ps : Unit affected by the stratagem vessel of the emperor don't need to have act of faith rule. So in theory you could cast the +1hit Act of faith and AE spread it to multiple Exorcist. -Celestine : Auto include, +1 invul save, rez unit, self rez, 4+ invul, 6 2+ s7 d2 melee attack. -Missionary : grant +1 A in 6 aura, cancel flee loss on a 4+. Classic sister squad : ws 4+, bs 3+, s/t 3 cost 9pt. Same as before. one special, one heavy still limited to melta/flamer/bolt weapons. Rhino et Immolator get the 6+ inv rule. -Geminae : Celestine bodyguard, can take them without her but they now take a slot. -Repentia : 3+ 3+ fight with an eviscerator (s*2 ap -2 d2) -1 to hit. -Misstress of repentance : Auto include if you have Repentia, grant them reroll charge, run and hit. Can trigger the 1d3 FP stratagem. -Preacher : Aura bot for the +1A in 6"
-Hospitalier : Heal or Rez model. -Death cult assassin : Reroll hit on charge or when charged. still 4 attacks 3+ s4 -2 d1 attack that reroll on charge for 17pts is ok.
-Seraphim squad : 3+ 3+ dual bolt pistol. 5+ invul from shield of faith, deep strike. can take 2 pair of flamer or fusion pistols. They are kind of good front liner with a shield combo you get them to 3++ can rez 3 per turn, once charged they can desengage move 12" and shoot again. -Dominion squad : Normal sister but they can equip 4 flamer/melta/stormbolter. Vanguard = make an extra move at the start of the game and if embarked the vehicule does it. It combo very well with the immolator as you can move 12 before the game, move 12 first turn and shoot your heavy flamer. Kind of nasty against horde army (you do this after disembarking your sister.) +1points from the sister. -Exorcist : pew pew pew 1d6 missile s8 ap 4 D6 at 48", they have shield of faith but can't cast AOF, so you need to use the AE stratagem to grant the +1hit. -Retributor squad : Classical dev squad but can take Heavy flamer. 6 options, only apply to Order infantry. -gain 1 FP when loose one unit. - +1 A/S when charging, charged or Heroic inter. 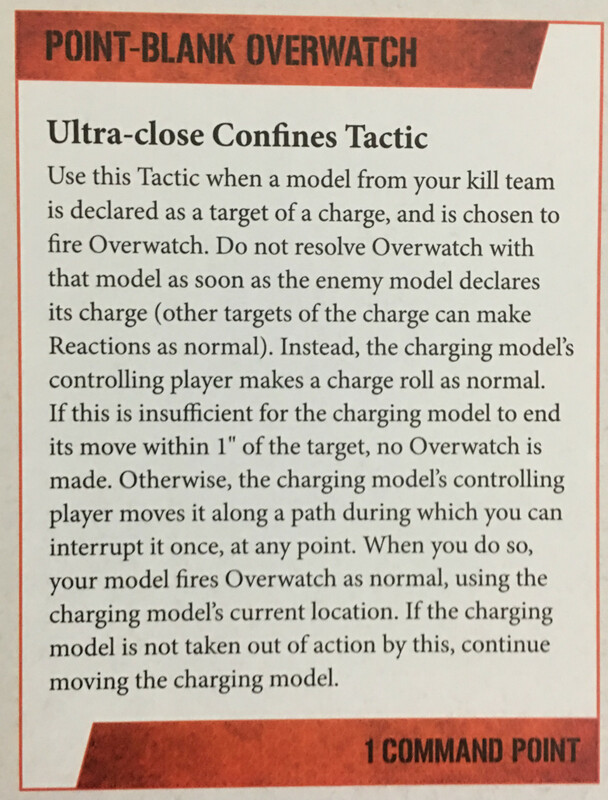 -Overwatch on a 5+ and never loose more than 1 model on a LD test. Martyrdom : 1d3 FP when a character die. Sacred banner of the millitant order (+1 Shield of faith roll for one battle round) Too bad it's only once. -Purity of fatih : 1cp, roll 1d6 on a 4+ negate the psychic effect. -Suffer not the witch : reroll failed wound roll against psycher. And that's is all for the Sororita ! Keep in mind it's a Beta Code while we wait for the sisters release this year !! This betaDex is interesting but i am not sure i like the intended play style (a big blog of inf/vehicule in the aura range). The intergration of priest and flagellant still feel artificial and i'd love to see more interaction/combo with the sisters.